13 October 2007 (Viet Nam Net Bridge) – A feature on a longtime Vietnamese collector of antiques, whose single pieces are worth up to a quarter of a million dollars. He is not even known by many antique collectors, but anyone who had a chance to see part of Duong Phu Hienâ€™s huge antique collection would be shocked by the value. The house of collector Duong Phu Hien is full of antiques, from the basement to the top, but the owner is very modest and doesnâ€™t like to boast about the collection. It was very hard for a Tuoi Tre reporter to get access to Mr. Hienâ€™s collection and to know about his most valuable collection of ceramics. Mr. Hien said that those antiques (ceramic-sekeleton pottery items with the colour of green beetle or do luc in Vietnamese) are treasures of treasures. Do luc pottery appeared in the Duong Dynasty of China and this kind of pottery existed from the 9th to 12th centuries only. The secret of making the enamel and the skeleton of do luc potterry has been lost. As a result, do luc pottery items are very rare in the world and they are very, very expensive in the antique market. Mr. Hien began collecting do luc pottery accidentally. In 1972, when he was a young officer, on his way through Vinh town in central Vietnam, he saw workers at a construction site excavating many broken pottery items while they were digging a foundation. 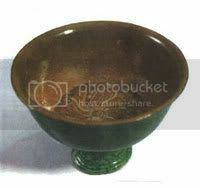 He asked for half of a bowl, which has fanciful green enamel and is very light. Since then he has collected do luc pottery. His friends know Mr. Hienâ€™s passion for pottery with green enamel so whenever they see such pottery items, they immediately tell him. The collector bought his first complete do luc pottery item in 1987 for $2,000, during a trip to Kim Boi in the northern province of Hoa Binh. Thatâ€™s a big bowl with a water-lily pattern made during the Ly Dynasty. This bowl is a heavy skeleton pottery item, which is easier to make and not as old as the do luc pottery with light skeletons. When he lent this bowl to an exhibition at the Louvre Museum in France, someone offered to buy it for $250,000. But this antique is a very, very small part of his huge collection of do luc pottery, at 350 items. Mr. Hien has refused offers to purchase all of those things. In his collection of do luc pottery, Mr. Hien loves a wine cup dating back to the Duong Dynasty in the 9th century the most. He said that the beauty of that small cup canâ€™t be described by words. That beauty is only felt by touching and looking at the cup. The ancient wine cup is 5cm in height, 2.5cm in diameter at the bottom and 8cm in diameter at the top, with green beetle enamel outside and yellow enamel inside, with daisy patterns. Early this year, a Taiwanese collector met Mr. Hien and asked to buy that cup for $28 million, but Mr. Hien refused, considering it a national treasure. The second famous do luc pottery item of this antique collector is a duck-shaped wine jar, also with a light skeleton. A Taiwanese collector also wanted to buy that item for $2 million. Another item that he also loves is a water jar, which he bought last Tet for $100,000. This jar has been appraised for around $1 million by a foreign antique collector in Asia Art magazine. Mr. Hien allowed Tuoi Treâ€™s reporter to take photos of the collection of do luc pottery and he talked about this collection. In the four-storey house which is full of antiques, where the owner has a very modest space to breath, there are over 100 Buddhist statues made of gold from Tibet and vu huong wood, bronze drums, 400 lime-pots of a thousand years old, royal robes of the Thanh Dynasty in China. All of those antiques are worthy to go to light to be admired by people of the current time. The owner of that treasure wavers between publicising his collection, the fruit of three generations of his family, and hiding it to not attract public attention and not to be bothered. The establishment of private museums in Vietnam has been â€˜protectedâ€™ by the Heritage Law but collectors still hesitate. The established private museums donâ€™t have really valuable items while the largest collectors donâ€™t want to show their collections. Big antique collectors still worry about opening their collections for many reasons. The largest reason is that the pioneers are always affected the most. They worry they will be asked about the origin of antiques. It is really difficult to explain about that when there is collector who can exchange a big house for a pair of jars. The second reason is difficulties associated with housing. All collectors in Vietnam are now living with antiques. Though they are considered to be rich, it is still very difficult to have areas that are large enough to display antiques. If the two above issues are solved, Vietnam will have many more private museums. Do you worry that you will be questioned about the origin, the price, etc. of your antiques so you donâ€™t want to make public your collections? I think there are three kinds of antique collectors in Vietnam. The first is the group of collectors who have real passion for antiques and collect antiques from generation to generation, systematically, scientically and methodocally. (I rank myself in this category). The second type is the group of people who have deep knowledge of and passion for antiques but donâ€™t have means to collect them (archaeologists, history professors). The third is the group of collectors â€“ traders (the biggest group of collectors). We should not look down on them because they contribute to socialise antiques but sometimes because of money, their antiques are not authentic, which affects the prestige of Vietnamese antiques in the world. I think that people maybe donâ€™t know but in the circle of collectors, we know the level of antiques of each owner and each antique has its story and history. My family has collected antiques for three generations. My grandfather is a physician, my father is a teacher and though we are rich or poor, we all have the same passion for antiques. I have exchanged antiques, which are worth millions of US dollars at present, for 100kg of cassava. I even exchanged tens of normal ceramic bowls for tens of ancient bowls. An object is valuable to one who knows its value and can be satisfied by it. When will you introduce your invaluable collections to the public? We, I and collectors in the Thang Long Antique Association, are preparing for a great exhibition on the occasion of the 1,000th anniversary of Thang Long-Hanoi capital. We want to gradually bring antiques to the public. I hope that I can open a real museum, not for myself only, in the future, perhaps during the 1,000th anniversary of Thang Long-Hanoi. I have a vase of sorts… that was sent to me from Vietnam in 1970 to the US. It was found buried there in vietnam. The vase is yellowish in color with a dragon etched into the glaze and a signature of the artist. It stands approximately 14-16 inches high the glaze is yellow and lumpy in appearance. the top of the vase is about 5-6 inches at it’s opening and has four loops with etching on thise bases attached to the top as if for carrying the vase. Do you have any info for me? I could send you a photo of it as well. Hello Greg oram: You can send me some photos of your vases to my email. I can have a look for you. I recently came across a brown ware cup, a house and tree are etched into the clay…etched into the bottom is BIFN-HOA VILTNAM…I took the F and the L to possibly be an E…there are upside down v above the F and L….the inside of the cup appears to be glazed….I was wondering if you might be able to provide me with any information about it….year it was made, region or kiln where it was made…. Bien-Hoa outside HCMC has long hosted kilns for domestic pottery and export. Some pieces can be quite elaborate and beautiful. Bien-Hoa is the southern equivalent of the Bat Trang village kilns outside Hanoi, although not as old as Bat Trang. Previous Post: Could smuggled antiquities be on sale on eBay?